This will be my last blog post for awhile. I left Mexico nine days ago to spend Christmas and New Year’s Eve with family living in the U.S. I am posting this from Memphis, where Christmas will be celebrated, same as last year, with NYE being toasted from Eastern Tennessee. My first stop, however, was Chicago, where I stayed with old friends and attended the wedding of my cousin Jessie. Prior to Jessie’s nuptials, the last time I saw her – or any of my cousins, for that matter – was over 11 years ago! I also visited The Herr, a Facebook friend from the travel world whom I had actually never met face-to-face. Our afternoon of suburban adventures included Gene & Jude’s Hot Dogs, countless brewskis (that’s “beers” to you non-Chicagoans), and sofa time with the world’s friendliest cat, Rusty. I must say, even with the zero-degree temps and subzero wind chill that overtook Chicago during the week of my visit, I rather enjoyed myself. In fact, I had a blast. 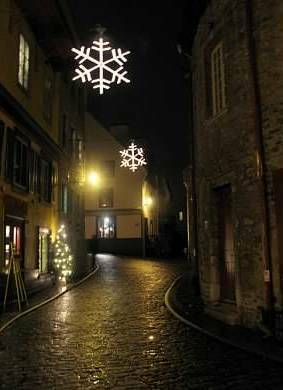 Last year I posted a series of “Holiday Travel” entries in which I posted favorite memories from holiday travels over the past dozen or so years – Thanksgiving in Stockholm and Copenhagen (2010); New Year’s Eve in Rome (2008-09); a Smoky Mountain Christmas (2011). Give them a read; they’re fairly short and the writing holds up well. I thought I’d add one more entry to the series. I was still a corporate drone in 2008; come November I had used up my vacation time for the year. Spending Turkey Day in Europe or Asia was out of the question as a result, but I consulted airline timetables carefully and came up with an itinerary that let me make optimal use of the four-day weekend that was already a guarantee: red-eye flights from LAX to/from Québec City and Montréal! Prior to 2008, French-speaking Québec was one region of Canada I had yet to visit. 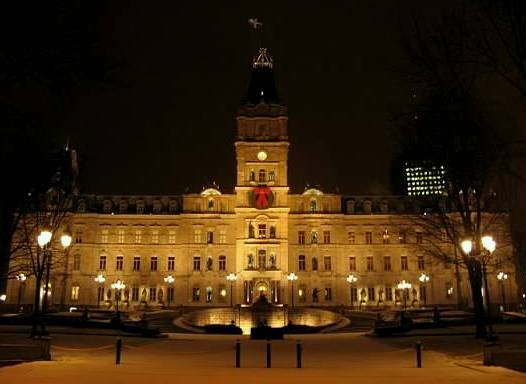 I knew of Québec’s claim to fame as the northernmost walled city in the Americas, and I had previously seen pictures of the city’s elegant Château Frontenac hotel, and of nearby Montmorency Falls. I wasn’t sure if I’d luck into snow at that time of year, but I was sure the city would feature lovely holiday decorations. My red-eye flight from LAX into YYZ (Toronto’s Pearson International Airport) featured a smooth connection to a short regional flight that landed in Québec City something like 10 am, which left me with the entire day. As provincial capitals go, Québec City is quite nice. The Old City spreads over a considerable distance, yet remains walkable. Most of it is enclosed by an immaculately-preserved stone wall that is open for circumnavigating in the warmer months, though closed in the winter. I loved it. The tourist heart of the city is a single pedestrian mall, Petit Champlain. Imagine the kitschiest Disney-in-the-snow walking street, throw in a funicular on one end, and that pretty much describes Petit Champlain. I loved it as well. Oh: as soon as I reached the start of Petit Champlain, it started snowing. Big, sticky flakes, the kind a camera captures with ease. Did I mention that I loved it here? My hostel was located in the Old City, and was a perfectly cozy place to spend the night. I had two really cool roommates, including a South Korean student who was doing a semester abroad in the Twin Cities, IIRC. That said, walking around in snow all day is fun, but also tiring; I literally fell asleep in the middle of our conversation. Sorry guys! The next day was more of the same, but I was sure to visit the aforementioned Montmorency Falls, a short cab ride out of the city. It snowed a lot overnight, and the freshly-fallen snow was piled high along the walkway leading to the falls. I didn’t stay long – the walkway leading to the top of the falls was closed b/c of treacherous conditions. Still, I was the only one there and those few moments of solitude added to my experience. I later visited the citadel, only accessible by guided tour. Our bilingual guide gave us plenty of time for pictures and exploring, and although the citadel has never seen action, it’s an impressive piece of military fortification, and still functions as a working fortress today. I pity any attackers foolish enough to try and take the city from below. As I am wont to do when I explore cities, I took the long way back to my hostel. I was enchanted by Québec City under an even thicker snowfall than the day before, and I wanted to frame the local ice skating rink with one of the city’s gates in the background. You can see the resulting pic below, it’s not bad if I may say so myself. The day passed quickly, and I knew I had to double-back and collect my pack if I wanted to make the last train of the day to Montréal, just three hours away. I missed the train. Conveniently for me, the bus station was adjacent to the train station, and I just made the last bus to the city, Québec Province’s biggest. I arrived late – after midnight I think – and hailed a taxi to my hostel, which as it happened, was less than two blocks away. Classic! The proprietor was none-too-pleased with my late night arrival, which surprised me, seeing that Montréal is acclaimed for its nightlife. He let me in and instructed me to pay in the morning. I stumbled over other sleeping backpackers and went to bed. I was a bit disoriented and I remember that sleep took awhile to come. The hostel was one of those that occupied two levels of a multi-story brownstone, and I remember that it seemed wayyyy too crowded for its small size. I imagine, though, that the owners have to pack it full every night if they want to make those mortgage payments. My friend Sari, who I knew from the same travel community as The Herr yet – like The Herr – had never met, offered me a couch at her place, but I turned down her offer, having a) never met her; and b) a girlfriend at the time who wouldn’t understand the concept of “couchsurfing.” Maybe I should have taken up Sari’s offer anyway? Still, the hostel’s shower was hot, the pancakes were good and the coffee was free. I have certainly stayed at worse places…. Montréal was cold. Biting. I had a bit less than two days here, so I figured this Chicago native could handle the chill. I made my way to the Old City, less impressive than Québec City’s and more “urban” in feel. I don’t recall where the Old City ended and the Central Business District began. It was a Saturday, and except for the area around the main cathedral, there weren’t many people out. I made it to the waterfront, a large grassy expanse with intermittent cycling paths and trolley tracks. This section of Montréal must be fantastic in the summer months. After a vigorous stroll the next morning up to a vista point on Montréal’s Mont Royal (hence the city’s name), my long weekend in French Canada had one more culinary treat: crêpes at Sari’s favorite breakfast spot. Our late breakfast was also the time of our first meeting. I can’t recall the exact crêpes I ordered but if I were a betting man I’d bank on the variety being bananas-and-chocolate. Sari and I compared travel bucket lists and promised to meet again soon; although neither of us knew it at the time we would ultimately reunite just four months later with other travel friends in Chile for Santiago-fest! It is getting late as I finish writing this. I wanted to post a few different “Holiday Travel Memories” for your enjoyment, Loyal Reader, but time got the better of me, as it often does, and so alas, there will only be one themed memoir for this calendar year. I really love the holidays, and although Thanksgiving 2013 was rather uneventful for yours truly (though I did eat turkey – a six-inch sub from my local Subway – Mexico), I’m always nostalgic for remembering old trips, and I hope to travel somewhere for Turkey Day 2014. As for this Christmas, I look forward to being with family, and I hope all of you are as fortunate as I am. Above pic: Parliament Building, Québec City. 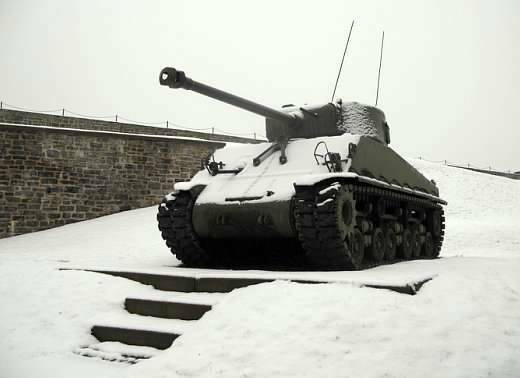 Below pic: Tank at the Citadelle de Québec, which is still an operating fort. 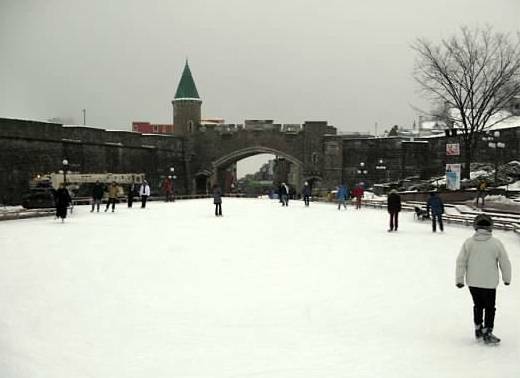 Above pic: Ice skaters near Québec’s Old City Walls. Below pic: Late night quiet streets near Petit Champlain. 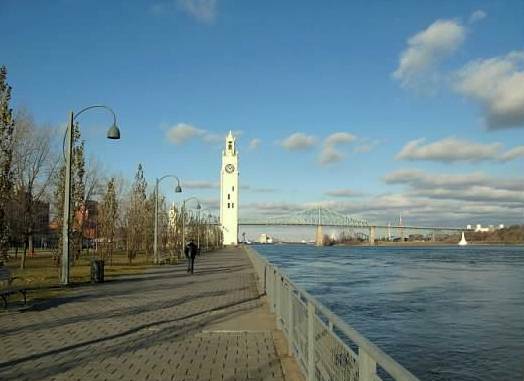 Above pic: A brilliantly sunny (and blisteringly cold) afternoon along Montréal’s waterfront. I will be sure to come back here in the summer sometime. 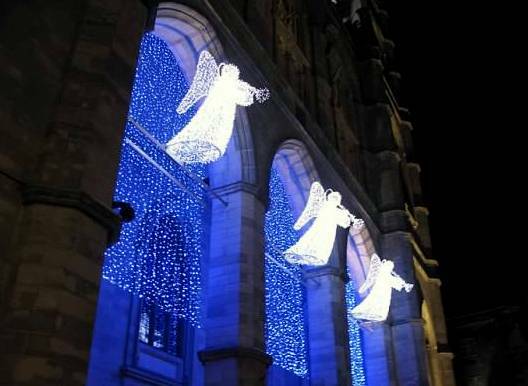 Below pic: Christmas angels in front of Basilique Notre-Dame de Montréal. If I recall correctly, you picked one of the *coldest* weekends ever to come visit Montreal. You should definitely come back in the summer, or at least on a less cold winter day. The couchsurf invite is a standing one. Yessss, it was cold but fun – just like how I spent last week in Chicago! I’ve always wanted to hit up Montréal in the summer, and hope to do so very soon. Thanks for the invitation Sari!